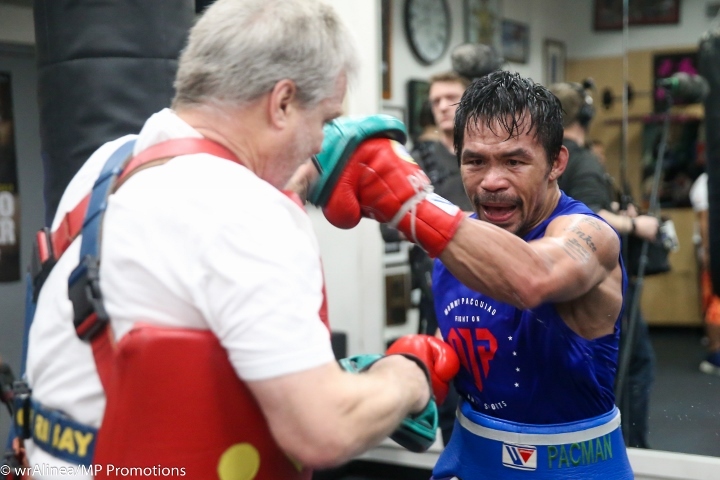 Freddie Roach has been pleasantly surprised since Manny Pacquiao arrived in the United States two weeks ago. Roach, reunited with Pacquiao for his fight against Adrien Broner, has noticed about as fresh a 40-year-old fighter as he could’ve imagined since they began working with one another again. If anything, Roach has had to slow down Pacquiao during training, so that the Filipino legend doesn’t over-train for his 12-round, 147-pound title bout against Broner on January 19 in Las Vegas. Almost twice that age, Pacquiao is significantly older than Broner, who’s 29. That doesn’t concern Roach because it is Pacquiao, not Broner, who’s known for being in superior shape and for being a volume puncher. Roach returned to Pacquiao’s team for the Broner bout following a one-fight absence. Buboy Fernandez, Pacquiao’s lifelong friend and longtime assistant trainer, was his sole trainer for his last fight – a seventh-round technical knockout of Lucas Matthysse. Roach expressed disappointment prior to that July 15 fight in Kuala Lumpur, Malaysia, that Pacquiao hadn’t reached out to tell him that he had decided to have Fernandez train him for the Matthysse match. Roach learned of their separation through third parties and media reports. The International Boxing Hall-of-Fame trainer maintained, however, that he was open to a reunion whenever Pacquiao decided the time was appropriate. Roach went as far as to say he would train Pacquiao for free because of his fondness for Pacquiao, in addition to his appreciation of how much training Pacquiao has helped him financially. Pacquiao decided late last year to reconnect with Roach, who had trained him for nearly 15 years. The strong southpaw started his training camp in the Philippines, but he moved it to Roach’s Wild Card Boxing Club in Hollywood, California, just before Christmas. Pacquiao (60-7-2, 39 KOs) will face Cincinnati’s Broner (33-3-1, 24 KOs, 1 NC) in the main event of Showtime’s four-fight pay-per-view telecast a week from Saturday night at MGM Grand Garden Arena in Las Vegas.